VHF transequatorial propagation (TEP) is so called because it involves the reception of VHF signals, or the making of VHF contacts, over very long paths that cross the geomagnetic equator. The frequencies are well above those supported by the familiar F-layer propagation at HF, and signal strengths are often much higher than would be expected for the distances involved. In addition, the paths involved are not those commonly experienced with VHF sporadic-E propagation, in length, geography and seasonal characteristics. There are two types, or modes, of TEP: afternoon-type TEP (aTEP) and evening-type TEP (eTEP), based on the hours they occur during a day. Paths cross the geomagnetic equator and range from 3000 to 6000 km (1800-3700 miles) in length, but longer paths have been recorded, e.g. a 144 MHz contact between I4EAT, Northern Italy (JN54VG), and ZS3B, Namibia (JG73), about 7800 km; observation of a 144 MHz ZE2 beacon (Zimbabwe) by DC3MF (Sth Munich, Germany), about 8000 km. The paths most regularly observed cross the geomagnetic equator within a small range of angles close to 90 degrees, and very nearly symmetrically spaced about the geomagnetic equator. Paths having an obliquity of 15 degrees or more experience considerably fewer occurrences, particularly in the bands above 50 MHz. Path terminals are generally situated in a zone between 30 and 55 degrees magnetic dip angle north and south of the geomagnetic dip equator. However, a station in one hemisphere will most often contact stations in a zone close to its geomagnetic conjugate in the opposite hemisphere. The map of the Asian-Australian sector shows examples of the paths observed (contacts made and signals heard). 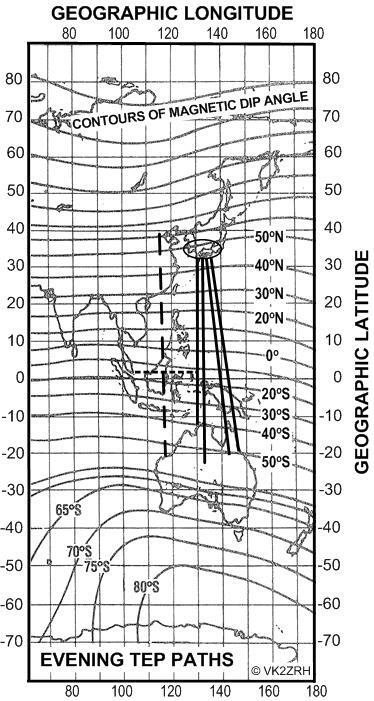 The short-dash line running from Singapore to the Darwin-Southern Japan path indicates an observation made by a Defence Science Establishment (now DSTO) scientist who received and recorded Darwin VHF beacons in Singapore one evening using a handheld antenna pointing skyward. The intriguing reason for this is explained later. Given that paths to 8000 km have been established in the African-European sector, evening TEP contacts on at least 50 MHz, and conceivably 144 MHz, over such distances could be achieved between Australia and Japan, e.g. from Coffs Harbour (or Armidale) in Northern NSW, or Woomera in South Australia, to JA7 on the northern coast of Honshu, Japan. Maximum observed frequencies (MOFs) for evening TEP extend to at least 432 MHz. No upper limit has been established. Since TEP was first reported in 1947 (Ed Tilton, World Above 50 MHz, QST, May and October 1947), MOFs for evening TEP climbed ever higher during each decade. Over the 1950s and 1960s, Australian amateurs and DX listeners observed VHF signals in the evening at frequencies up to 70+ MHz. In the late 1960s, Stuart Kingan ZK1AA on Raratonga, Cook Islands in the South Pacific, observed NTSC chA2-A6 TV signals from Hawaii on frequencies up to 90 MHz. Until the mid-1970s, the highest frequency observed was the 102.7 MHz Defence Science beacon in Darwin recorded in Yamagawa, Japan. On 8 November 1976, around 0040 UTC, YV5ZZ in Venezuela noticed Mode A downlink signals from Argentina via Oscar 7 some 10 minutes earlier than normal AOS. On listening to the 2m uplink frequency, YV5ZZ heard LU7DJZ direct, over a 5000 km path (reported in World Above 50 MHz, QST, January 1977). Then, on 29 October 1977, YV5ZZ contacted LU1DUA on 144 MHz, a 5044 km path. Subsequently, on 24 February 1978, VK8GB in Darwin, Northern Australia exchanged reports on 144 MHz with JH6TEW in Kyushu, Japan, a path of 4950 km. On 28 April 1978, ZE2JV in Rhodesia (now Zimbabwe) worked 5B4WR on Cyprus on 144 MHz, a path of 6300 km. It appears the first recorded instance of evening TEP on 432 MHz was the reception of the ZE2JV beacon by SV1DH in Greece, on 20 March 1979, a path of 6300 km. Evening TEP has a peak diurnal occurrence between 2000-2300 LMT (at the midpath, where it crosses the geomagnetic equator). It may open a little earlier, and extend past midnight on the lower frequencies, but openings on the higher frequencies rarely extend past 2300 local time. Openings peak around the equinoctial months of March-April and September-October, particularly for the higher frequencies. All this clearly apparent in the diagram showing the diurnal and seasonal characteristics of evening TEP. On the lower frequencies, openings may still occur through the solstitial months. Evening TEP openings are more frequent during high sunspot years, although never disappear during solar minima years. Researchers have noted that the requirement of path symmetry about the magnetic equator is more important during solar minimum than at solar maximum. Observed signal strengths for evening TEP can range from weak to very strong, although signals of weak to fair strength are more usual. Path loss can, at times, be substantially less than the free-space path loss for the distances involved, but is generally 20 dB to 50 dB greater than that. For a 6400 km path, for example, free-space path loss is about 150 dB. Signals as strong as -66 dBm (S9 being -73 dBm) have been observed (e.g. in the South American sector), while signals in the range -85 dBm to -110 dBm seem to be typical in the JA-VK sector. Signals rise in strength rapidly from the start of an opening, typically reaching a peak within 15-20 minutes, after which they plateau for a period before declining slowly. For a given opening, signals are generally of higher strength at the lower frequencies. Evening TEP exhibits a characteristic 'fluttter' fade at rates up to 15 Hz on 50 MHz and rather faster fade rates on higher frequencies, often giving 144 MHz signals a 'raspy' quality. The fading can also be 'choppy', fading out completely for fractions of a second. 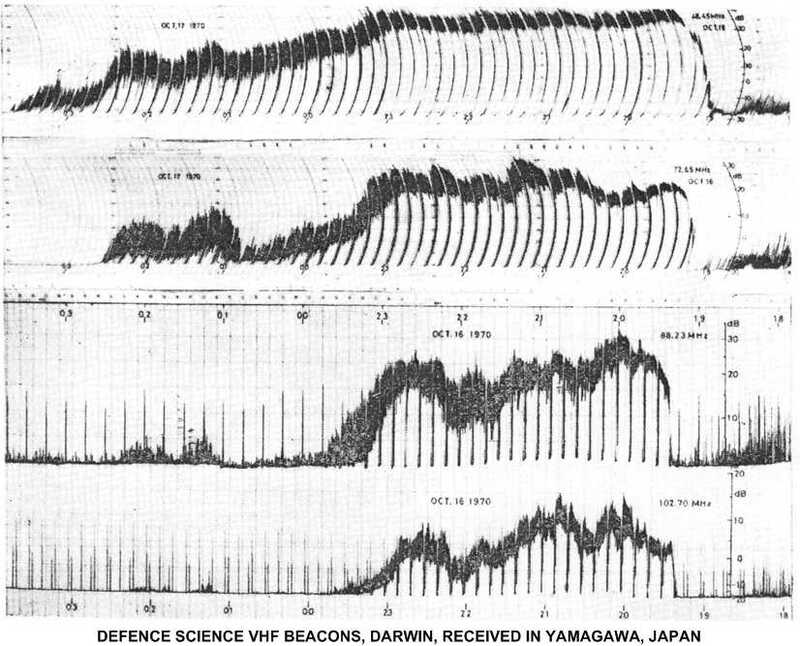 The chart recordings of the Australian Defence Science beacons at Darwin, on 48, 72, 88 and 102 MHz, as received in Yamagawa, southern Japan, over 16-17 October 1970, illustrate many of the general signal characteristics of evening TEP. The time axis proceeds from right to left; the vertical markers are at 10 minute intervals. Note the steep rise as the path opens, the lower frequencies opening earlier than the higher frequencies, and the lower frequencies continuing after midnight, while the higher frequencies decline after 2300. Note also the rapid fading of about 5-10 dB, ranging up to about 15 dB, and the longer period fades of about 40 minutes to an hour between peaks (Kuriki et al, Journal of Radio Research Labs, Japan, Vol. 19, 1972). Doppler shifts of 20 to 50 Hz on 50 MHz are observed, and similar Doppler 'smearing' or spreading of signals. On 144 MHz, Doppler shifts vary from +50 Hz ranging up to -350 Hz have been recorded, generally averaging around -100 Hz. However, Doppler spreading of more than 1 KHz has been recorded, giving rise to remarks that the signals "sound like auroral or moonbounce" reception. The diagram shows the pattern of Doppler shift on the 144 MHz signal of ZE2JV in Harare (Zimbabwe) recorded by SV1DH in Greece for two eTEP openings during October 1980. The propagation mode of evening TEP is via 'ducting' or 'guiding' through field-aligned 'bubbles' of depleted ionisation which thread the equatorial ionosphere and extend symmetrically north-south across the geomagnetic equator. The general details are illustrated in the diagram below. Ionisation inside the bubbles can be very sparse - a 10th to a 1000th less than the surrounding F layer, while the bubble wall has a sharp boundary, where the ion (and electron) density changes rapidly between the inside and the outside of the bubble. A signal from a VHF transmitter at a favourable location in one hemisphere enters the end of the bubble at a grazing angle to the magnetic field at that point and then skids around the top wall until it exits the bubble in the opposite hemisphere where a station at a favourable location can receive the signal. These equatorial plasma bubbles ('EPBs') appear in the base of the ionosphere about an hour after the sun has set at that height (around 250-350 km). They rise up and extend rapidly along the curved magnetic field lines, drifting eastward at speeds of 25-125 metres/second. Their upward motion is typically 125-350 metres/second; some have been measured rising at supersonic speeds of more than 2 km/sec! They rise to peak heights of 1500 km or more at the geomagnetic equator and their ends can extend to more than 40 degrees dip angle; i.e. south of Darwin and north of Yamagawa in southern Japan. The reason for the observed flutter fading and the Doppler shift and spreading is now abundantly clear! The diagram illustrates the general development of the EPBs and the consequent influence on signal elevation angles and path lengths. The bubbles may be 40-350 km in diameter and successive bubbles may be 40-100 km apart. The walls are not smooth, except for the early phase of their development, are often bifurcated (e.g. like looking up an elephant's trunk), and are sometimes remain open at the bottom. When this latter feature is present, the propagation can 'leak' to locations below and to the side of the bubble. Indeed, there have been reports of such events. For example, as mentioned in Part 1, I saw a presentation given by Doug Fyfe, a Defence Science Establishment (now DSTO) scientist, who received and recorded Darwin VHF beacons in Singapore one evening using a handheld antenna pointing skyward. EPBs have diurnal and seasonal characteristics that match those of evening TEP, which is why eTEP is observed to behave as it does. The diurnal characteristics of eTEP at 44-48 MHz and 144 MHz over the JA-VK path are compared to that for EPBs (global average of satellite measurements) in the diagram below. 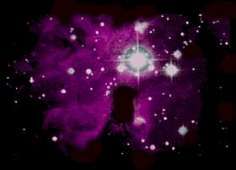 To tell when eTEP propagation is likely on any given evening, you can look for the precursors, or the 'signatures' of equatorial plasma bubbles. There's the time-hounoured method of monitoring upper-HF and/or lower-VHF signals from suitable locations. For example, monitoring the JA2IGY NCDXF/IARU time-share 5-band HF beacon in Japan from around 1900 LMT (see http://www.ncdxf.org/beacons.html). Developing EPBs will cause multipath and and off-great circle propagation on the 21 MHz and 28 MHz beacon signals (or whatever else is being monitoring). Look out for characteristic sudden, deep fading patterns and phase distortion. When flutter fading arrives, you know there may be bubbles in the equatorial ionosphere. Fortunately, the Ionospheric Prediction Service Radio and Space Services vertical incidence ionosonde at Vanimo, on the north coast of Papua New Guinea, is ideally placed to detect the presence of EPBs. They produce characteristic range-spreading, or 'spread-F', on ionograms. Extra 'traces' appear suddenly on the ionogram, as shown in the examples in the attached set of images. The presence of spread-F on Vanimo ionograms is a necessary, but not sufficient condition of itself for VHF evening TEP.